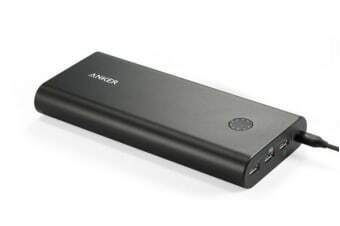 Read customer reviews of the Anker PowerCore+ 26800mAh Power Bank (A1374H11). After a purchase, we invite our customers to leave a product review. The customer reviews for Anker PowerCore+ 26800mAh Power Bank (A1374H11) are below. product is great with good quality and holds is charge as described ...very happy with it. Fast charge and several charges will last several days camping. On a recent family holiday to Samoa the power pack was invaluable charging phones, I-pods, I-pads and even cameras as we travelled around. That was for a family of 5 adults and 2 children so the power pack was used on a daily basis and charged each night. A fantastic product. Only issue, thought from advertisement for product that a USB C Port/cable was included in product. Otherwise found quality and function as expected. works even without teh extra adaptor to connect to power..though we might buy that too? Goods arrived in good condition but it will take many months to validate performance and reliability.